Denna produkt ger dig 1005 bonuspoäng. Vagnsset med 3 godsvagnar typ ÖBB, totallängd över buffertar 41 cm, epok III. Model: The type R 20 car has truss rods. Removable stakes are included. Total length over the buffers approximately 41 cm / 16-1/8'. DC wheel set E700580. Prototype: Three different Austrian Federal Railways (ÖBB) freight cars. One boxcar, one type 'Klagenfurt' gondola, and one type R 20 stake car with pressed metal stakes. The cars look as they did in Era III. One-time series. 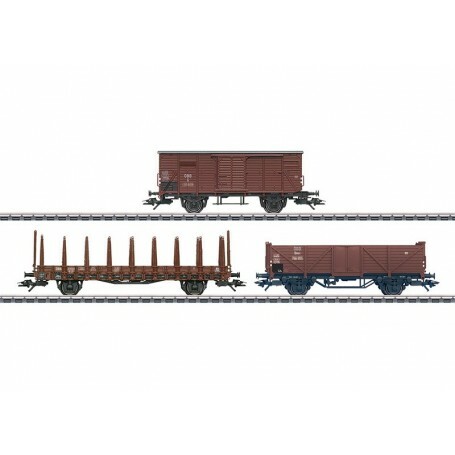 A class 694 steam locomotive to go with this car set is being offered in the Märklin H0 assortment under item number 37179.